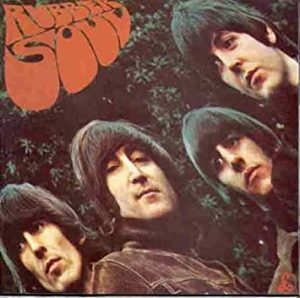 In 1965, The Beatles recorded their sixth album, Rubber Soul. The Beatles were still touring, still rushing into the studio to record fresh songs at a frantic pace. But "Rubber Soul" took the group in a new direction. Rubber Soul was recorded 53 years old. "Rubber Soul" was a pivot point between `She loves you, yeah, yeah, yeah,' to Revolver to Sgt Pepper's Lonely Hearts Club Band. • Rubber Soul: 3 December 1965 . . .
• Revolver: 5 August 1966 . . . The songs demonstrate the Beatles' increasing maturity as lyricists and, in their incorporation of brighter guitar tones and new instrumentation such as harmonium, sitar and fuzz bass, the group striving for more expressive sounds and arrangements for their music. Rubber Soul inspired tons of artists – including Brian Wilson, who crafted the Beach Boys' 'Pet Sounds' in reply; the Beatles, in turn, responded with 'Sgt. Pepper's'. The album consisted of eleven songs by John and Paul, two by George and another with the unique writing credit of Lennon-McCartney-Starkey. The inclusion of a sitar on the song Norwegian Wood (This Bird Has Flown) also illustrated George's growing interest in Indian music and culture.